Sometimes what is all around us is the most difficult to see clearly. Drylands occupy about 41 percent of Earth’s surface and support 38 percent of its population, but such expansiveness poses a challenge to understanding the effects of climate change on the soil fungi and bacteria that are key to how those lands function. Getting some perspective required gathering soil samples from 80 global sites through the contributions of research groups around the world. Matthew Bowker, assistant professor of forest soils and ecosystem ecology at Northern Arizona University, and Becky Mau, research specialist with the Center for Ecosystem Science and Society, were two of the researchers involved. The research study, published in the Proceedings of the National Academy of Sciences, concluded that microbe diversity and abundance both decline as temperature and aridity increase. The authors predict that further increases in aridity predicted by climate change models will likely cause declines in microbial diversity and abundance because soil carbon, their food source, will become less abundant. That potential outcome raises the stakes for the hundreds of millions of people who rely on drylands for crops, livestock forage, fuel and fiber. 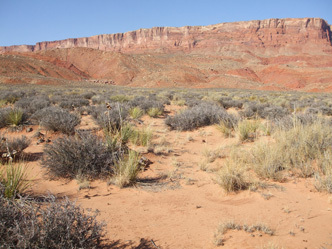 Bowker and Mau participated by gathering samples in 10 sites of the Colorado Plateau eco-region; nine of those sites were in Utah, and one was in Arizona. For a previous, related study, he had helped develop the statistical model for examining the effects of soil nutrients on plant production in increasingly arid drylands. Next year, Bowker will also participate in a new, more comprehensive network study designed to detail and understand ecological effects of livestock grazing and climate in drylands.